At the point when companies experience the gap between their projected revenue and the revenue required to sustain their businesses, they will need a capability for strategy innovation. Strategy Innovation is a methodology that enables an organization to align on a preferred future for the company by identifying new ways to create new value for the customer. Apple is able to do it right continuously, and Polaroid could not. Strategy Innovation was born out of frustration. We were frustrated that our success rate in product and service innovation wasn’t as high as we felt it should be. As we stepped back to research what was working and what wasn’t, we discovered where we were unsuccessful. 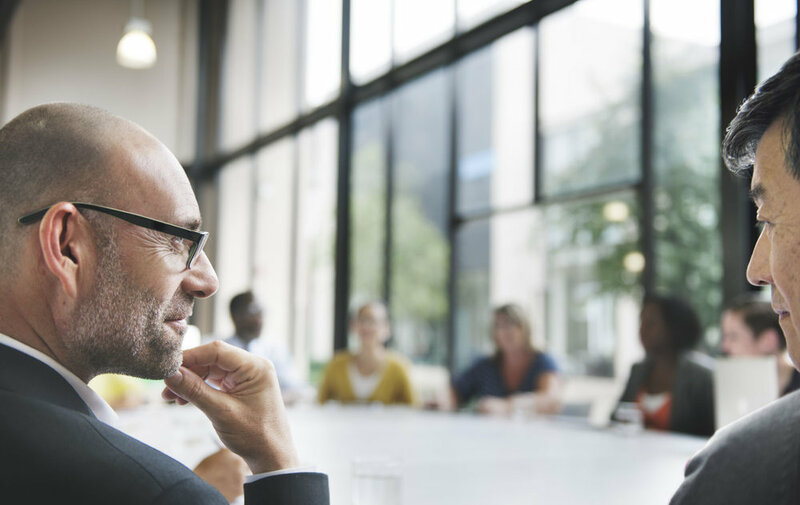 It was typically due to a lack of alignment across senior leadership on their growth strategy. By applying Strategy Innovation, we began to help companies define what their preferred future might be. What we found was not only did our success rate dramatically leap north, but we were also able to accelerate speed to market. Think of it as a process for FutureBack Strategy. Do Strategy Innovation first, then strategic planning. Today, we start out at the senior leadership level, and we strongly recommend doing Strategy Innovation first, then do strategic planning. We will distinguish between the two because I suspect most are already skilled at doing strategic planning. Strategic Planning is primarily analytical; typically numbers driven, company centric. It’s logical and linear. It’s planning from today to tomorrow. It extends current value, and it fits the current business model. Strategy Innovation by contrast is creative versus analytical; insights driven versus numbers driven. It’s market-centric versus company-centric. It involves iterative leaps for creating value. You plan from tomorrow back to today. You look to create new value instead of simply extending today’s value. Lastly, it’s all about the creation of new business models, new ways of doing business and new ways of delivering that new value. Sustaining the Fortress – Orchestrating near term operational excellence and results in a way that the organization meets or exceeds quarterly goals. Creating the Future – Providing the clear and loud mandate for sustained innovative growth and equipping the organization with a methodology for identifying and monetizing new opportunities near to long term. Sustaining the Fortress is about protecting and extending the way business is done today. It’s all about operational excellence and rewarding stakeholders in the near term. The second accountability, Creating the Future, is about identifying those new growth opportunities that will ensure the vitality of the organization in the long term. 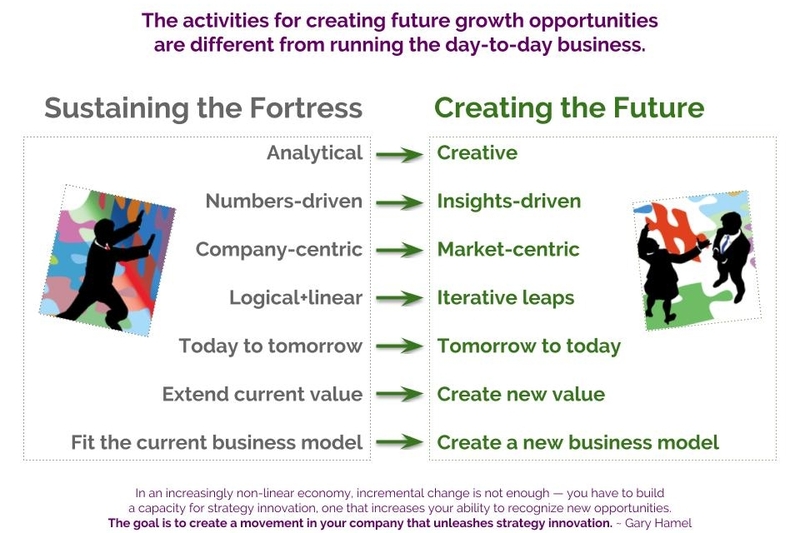 Strategic Planning is all about sustaining the fortress in most companies and Strategy Innovation is all about creating the future. The balance of these two accountabilities is critical. When the time comes to develop a strategic plan, the frame of reference is often rooted in the past - What have we done before? Where have we had success? Where have we had failures? - and extrapolated out into the future to get a sense of the predictable landscape. Swiss watch manufacturers couldn’t see beyond the ball bearings and the intricate movements, and Polaroid couldn’t see outside of their type of camera. Is your organization on a transformative track for growth with a loud and clear mandate? When senior leadership wants to create new internal capabilities for growth, they are ready for Strategy Innovation and the exploration of their organization’s Strategic Frontier. Without a growth mandate from leadership, the organization will not be aligned on a growth imperative. In our next blog-post, we’ll explain why Strategic Frontiers are the starting point for innovative growth.